Win dinner for 2 at Wulf & Lamb! Home > Uncategorized > Win dinner for 2 at Wulf & Lamb! 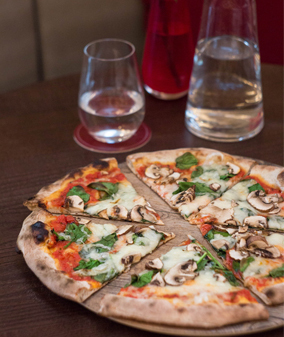 Beat those January blues and take part in Pavilion Road’s Instagram post to be in with a chance to win a pizza dinner for two with a bottle of house wine or Prosecco and a dessert each. These delicious (and healthy!) pizzas are new to the menu and come in a delicious array of four flavours from chili, red peppers and olives, to broccoli & artichoke. To enter, like Pavilion Road’s competition post which will be shared on Instagram on Wednesday, 16 January 2019. Tag a friend who you would like to share your prize with and make sure you are both following Pavilion Road on Instagram. The competition will end at 11.59pm on Tuesday, 22 January. The winner be chosen at random and announced on Wednesday, 23 January 2019. Bookings are available from Monday – Friday only, and past 5pm, and must be made prior to visit. The prize must also be redeemed by Friday, 22 February 2019.